One of the biggest unanswered questions about Mopar’s latest demonic-spawnmobile, the Dodge Challenger SRT Demon, is just how many angry devil horses will be snorting fire under that hood. We’ve established that 757 horsepower would be a letdown, because don’t riding mowers have that much now? A picture posted to Instagram suggests 900 HP, which would be suitably unholy. 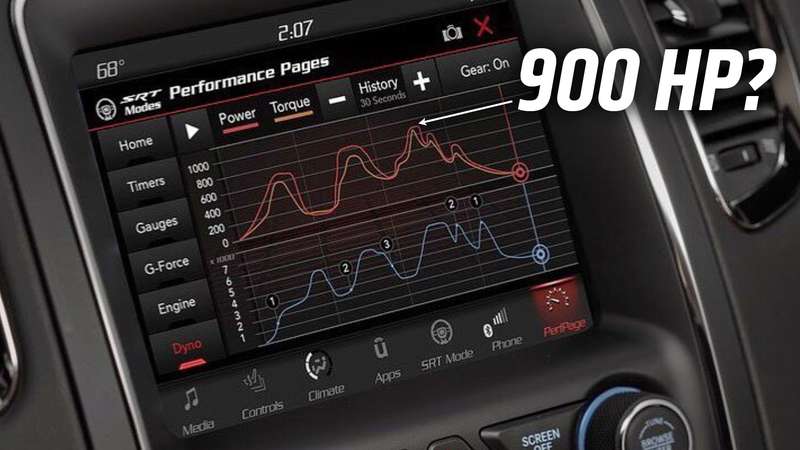 The picture was posted by Ryan Nagode, a designer over at Fiat/Chrysler, and that location does say ‘FCA- Product Design Office.’ Ostensibly, the image is just to show the refreshed UConnect center stack screen, but what’s on that screen can’t be an accident: a dyno graph showing a peak HP of what sure as hell seems like 900 HP. That’s a lot of HP. Now, the poster does go out of his way to say the image is for ‘rendering purposes only,’ so maybe take this with a grain of devil-salt, but, really, who knows? It’s not like this would be so out of character for FCA, who’s mantra lately has pretty much been cramming the biggest engines possible into whatever they have laying around. There would be a perverse sort of satisfaction knowing that there’s a car out there with Veyron-approaching power that is full of parts-bin crap from a Chrysler 200. And, for all those poor bastards desperately trying to get up a gentle slope with only the meager 707 HP of the Hellcat, this could be a welcome chance to upgrade. So, is this real? Who knows? Is it possible? Sure, why not? Would 900 HP be unholy? Of course. That’s the whole point. UPDATE: As commenters have pointed out, this seems to be a Durango dash. A 900 HP Durango Demon isn’t necessarily something I’d hold my breath for. I wonder if they'll shoot for a palindromic 909?